Leslie Basham: What was your life like at age fifteen? Here’s what Katie Laitkep remembers. Katie Laitkep: I would sit on a metal stool for about eight hours a day in this room that felt a lot like an aquarium. I would just sit there, and about every ten, fifteen minutes or so, I would walk to the front of the room and I would get an injection in my arm. Then I would go back. I would sit, and I would wait. Then I’d go back. Every ten to fifteen minutes I would do that—for eight hours a day, day after day after day, for weeks! Leslie: This is Revive Our Hearts with Nancy DeMoss Wolgemuth, author of The First Songs of Christmas, for Friday, December 7, 2018. Nancy DeMoss Wolgemuth: Here on Revive Our Hearts we’ve been in a series called “The Wonder of His Name.” We’re getting to know Jesus better during this Christmas season by studying His names. We’re taking a break from that series today because I want to introduce you to my friend Katie Laitkep. Beginning at a young age, Katie went through some really dark times. In fact, she still faces some huge challenges today. I know her story is going to encourage you as you face circumstances that just don’t make any sense. As you’re listening to today’s program, the Lord may bring to mind someone you know who is in a dark season. I hope you’ll send them a link to the video version of this story. Our team did a fabulous job capturing Katie’s journey with intense physical pain. You’ll find that video at ReviveOurHearts.com. Now, let’s get to know Katie. Katie: I grew up in the church and a home where the Bible was taught. There's not a point that I can think of where I first heard the name of Jesus. It was just part of my childhood. But I had never really needed God in a way that I did once I became sick. I could live my life. I was successful in school and good at school. I like it. I was able to do what I wanted to do without having to depend on the Lord for anything. So I had a relationship with Him, but it was mostly focused on me. I then went on to a private school where I would sit in chapels each week. I regretted that I didn't have the same testimony that a lot of the speakers did. I remember as an elementary student wanted to be the person who had the dramatic testimony, someone who had experienced incarceration or drug abuse, just so I would have that kind of story. I had no concept of what the grace of God is. I had no understanding of the nature of the cross and what my sin had done. At that point I would say that I was a believer, but I wasn't believing God for much. When I was in fifth grade, I first started getting sick a lot. I was missing school all the time. The year after that I was in sixth grade, and I was hospitalized for the first time with a very severe migraine that just lasted for weeks. It was pain that would not stop, no matter what we tried! My symptoms have primarily been neurological, mostly different forms of headaches and migraines, but also different forms of migraines—ocular migraines that cause me to lose my vision, a lot of fatigue, brain fog, and memory loss. I also have joint pain, arthritis-type symptoms, some psych symptoms where the illness causes anxiety and even depression at times. The worst have been cluster headaches, which are nicknamed “suicide headaches.” When those happen, you feel like you’re being stabbed in the eye with an ice pick! By the time I was about sixteen, I was told that I had multisystem organ dysfunction. My family became really desperate, so I went to a health clinic in Dallas. It was a place for people who’ve exhausted all conventional medical options. The walls were completely steel, porcelain. It was just a really cold, clean kind of place. You weren’t allowed to have any kind of fragrances or electronics. Nothing could be brought in from outside because they were afraid that people would become allergic to it and it would make them worse. I was the only pediatric patient at that time, the only teenager. I would sit on a metal stool for about eight hours a day in this room that felt a lot like an aquarium. I would just sit there, and about every ten, fifteen minutes or so I would walk to the front of the room. I would get an injection in my arm. Then I would go back. I would sit, and I would wait, and then I’d go back. Every ten to fifteen minutes I would do that—for eight hours a day, just day after day after day, for weeks at that clinic. If you brought in a book, it had to be wrapped in cellophane because of the concern of paper and ink and how that can cause allergic reactions, so it was really difficult to even have a book. You couldn’t have electronics. So you just sat there all day long and just waited for them to get to you and give you the shot and then sit back down. It was a lonely place; it was pretty miserable. The days were very, very long. I remember it being fairly big and empty, but I just felt claustrophobic all the time in the midst of the circumstances that I was in! I just felt like day after day I was trying different things, and nothing was working. It just became suffocating. I knew that God was good; I could see that. I saw that in other patients. I saw it in my family. I grew up hearing that and believing it, but I didn’t think that God was good to me. I didn’t know if He really could be trusted. It was easy to believe that when things were good, but when things were not working out the way that I wanted, it was hard to know if He really was good to me. As I put my faith and my hope in my doctors, thinking that they were going to give me the answers that I wanted, and they failed, I had to turn to Christ. I just remember begging Him to show me if He was good if He was trustworthy. After I had been there for, probably a few weeks at that point, I think the doctor could tell . . . I think he realized that I was still a teenage girl among all of these adults, and that I was the only one. He could see that I was in a lot of pain and that being there was miserable. It was how I was spending my summers as a high school sophomore and junior. At that point I had heard about Revive Our Hearts, and I downloaded all of the old episodes, all of the old radio series that I could find on to to that iPod. I just sat there and while I was waiting for injections—every ten to fifteen minutes—I would sit there and just listen to Nancy teach . . . for hours and hours and hours! Nancy (on radio): Maybe you’re at a season in your life when it’s tempting to think, God hasn’t really been good to me. How do we counter that? The truth is that God is good! He is good, whether or not His choices seem right to us, whether or not we feel it, whether or not it seems true, and whether or not He gives us everything that we want. Katie: As I was listening to Nancy teach, it allowed me to breathe a little bit more and to be able to realize that this was the place where God had me. Nancy (on radio): We’ve all had circumstances in life where we felt so helpless. But it’s a good place to be, because not until we realize how helpless we are do we cast ourselves upon God, who is our helper. Katie: If He had put me here, then it was with great purpose, and this was the background that He was using for me to get to know Him personally and to bring glory to Him. Nancy (on radio): The greatest growth happens in the hardest places! Katie: I could all the sudden stay there and feel peace and feel like, even if it didn’t work or even if I was wasting my time, so to speak, that I was in this place where God was present. Nancy (on radio): True blessing is not the absence of hard things, but it’s Christ’s presence in the midst of the hard places! Katie: Sitting in the midst of it, just hearing her teach, I could get to know Christ in a way that I would never be able to if I was healthy and out doing normal teenager things! I, all the sudden, had all this time to get to know who He was and know His character and know HIs heart. And in a way, by listening to those messages, I got to study His Word and find out more about Him. Nancy’s always said that anything that makes you need God is a blessing, and in that season I needed Him desperately. Through what was being broadcast, I realized that even these terrible things that were making me need God could be good, because they forced me to rely on Him and to know Him in different ways. By donating to Revive Our Hearts, people may think that they’re just giving money or their resources, but they’re giving people like me—patients and teenage girls who have no other hope—they’re giving us Christ! That’s what they did for me. People don’t realize that those messages changed my life! Nancy (on radio): How do we praise God when our eyes are filled with tears, when it costs us something to praise Him? Nancy: We’re listening to the story of Katie Laitkep. I’m so grateful that God used the Revive Our Hearts podcast to reach her in such a dark place! He also used a book that she learned about through Revive Our Hearts. It’s called Lies Women Believe: And the Truth That Sets Them Free. Katie: I read Lies Women Believe the year that I turned eighteen. It was just what I needed at that point, because I knew that my future was not going to be like anything what I had planned. For so long I had put all of my identity in academic achievements and accomplishments. Now I didn’t know if I was going to be going off to college the following year. I didn’t know if I was going to ever be able to leave my house and function in the world, and a lot of what I thought I knew about the world just shifted. So I got that book. Nancy: As this hungry-hearted teenage girl read this book, the Lord began to open her eyes to some lies she had been believing and, more importantly, He began to help her see the truth that would set her free! Katie: So if I didn’t get that book, I think it would be a struggle to get out of bed! Katie: I started to realize that my illness was not just about me. Nancy: Katie identified with another lie addressed in Lies Women Believe: “It’s all about me.” And then she began to see the truth that everything we go through is all about God and His good kingdom purposes. I knew physical pain, and I knew how sinful I was. I looked at Him and I saw that He knew more physical pain than I did, but He didn’t have any of the same sin that I did. And He still chose to suffer so that I would be righteous. Experiencing the suffering that I was going through changed the way that I looked at Christ’s suffering. It was extremely humbling to know what He took on and that He would step into this broken world! The more I had to repent of my selfishness and making things about me and focusing on my own glory versus God’s made me realize that I had always thought my biggest problem was my illness. Once I was diagnosed, I thought that my biggest problem was Lyme bacteria, but sin is such a greater problem than my illness! One of the big lies that I believed was that God should heal me, or that He should fix my problems, that I deserved to have a life of comfort or of healing, that these are things that are expected. I’ve benefited so much from people like Joni Eareckson Tada, whom I heard on Nancy’s broadcast. Hearing Joni talk about what God was doing in the midst of her suffering, knowing that she was still very much in the battle, that she wasn’t telling her story from a place of complete physical healing, that she’s not going to see it this side of Heaven . . . but God was still using her to spread His hope and His joy and purposes to others in the midst of her struggles. Because of the tender mercy of our God whereby the sunrise shall visit us from on high to give light to those who sit in darkness and in the shadow of death, to move their feet into the way of peace (Luke 1:78–79). I remember hearing that Christ, who is the Sunrise, that He came to give light to those who sit in darkness—both in the darkness of our sins, but I also started to think of all of the people that were like me, that had been sitting in circumstances where there was no light that could be seen, no hope of healing anywhere near, not a lot of comfort to be found. There are people who are just sitting there knowing, This is probably going to last for a really long time! Then knowing that Christ came to give light to my darkness! I started to hear those verses as a command that I needed to find a way to give His light to others who sat in darkness. So I now work in Houston as a hospital teacher. I work for the public school system, but I get to teach sick kids and those that are in really similar situations to what I experienced in high school and middle school. I’ve had several kids who did not leave the hospital—kindergarteners and second-graders who have gone home to be with the Lord way before they should have! I’ve gone to both Christian celebrations of life and some of the darkest, most hopeless memorial services that you can imagine as I’ve sat through services for students who were not believers. It has increased in me just the sense of urgency that time is short, that God is good, and He is willing to redeem. But we don’t know how much time He has given each of us! It’s forced me to rely on Him in different ways and to figure out how to serve Him well with the time that I have. It took ten years before I was diagnosed with Lyme disease. Through Nancy’s teaching, I learned that if I do have Christ and I have His Word, I don’t even need health. For years, that’s all I was chasing—to find a cure, or not even a cure, to find the diagnosis of what was making me so sick, to find out what was wrong. I thought that if I had that, then my life would all the sudden be better, that if I could just be well, then my life would be fulfilled. I spent so many years chasing all these different things, thinking that was what I needed. Through Revive Our Hearts, I realized that if I have Christ, I’m okay! Nancy: That’s my friend Katie Laitkep, reminding all of us that true hope only comes through knowing and trusting Christ. Perhaps you know someone who needs that true hope today. So I sent her a link to a beautiful video that our team has produced, sharing Katie’s story. You’ll find that video at ReviveOurHearts.com. Then share it with someone else who could use the perspective and the hope that Katies has shared with us! You may not be aware that Revive Our Hearts frequently releases new videos. You’ll find encouraging stories, helpful discussions and Bible teaching to help you grow. So if you’re a YouTube user, let me encourage you to subscribe to the Revive Our HeartsYouTube channel. Then you’ll be sure to see each new video as it’s posted. 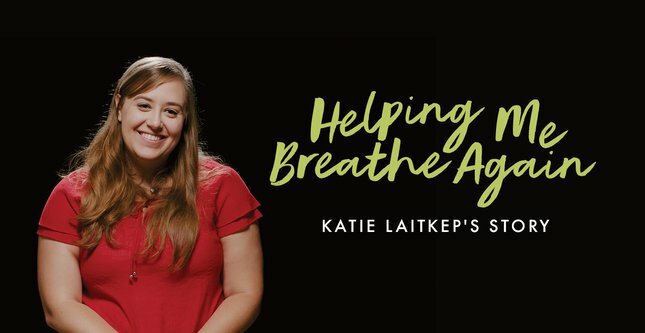 We’re able to produce resources like these videos and podcasts and books, like the one that encouraged Katie Laitkep, thanks to listeners like you who pray and support the ministry financially. Just think, if you’ve given in the past to help make Revive Our Hearts possible, you might have played a role in Katie’s story. A hurting, lonely, fifteen-year-old girl who felt hopeless found true hope in Christ thanks to listeners who supported Revive Our Hearts. I love that! But there are so many more women in all kinds of hopeless situations, and we want to get this message to as many of them as possible, but we need your help. Your gift at this time will impact the number of women that we’re able to reach around the world during 2019. When you get involved now, your gift will be doubled! That’s because of a matching challenge that’s been offered to us by some friends of the ministry. Every gift that is given between now and December 31 they are matching, they are doubling—up to a total of $750,000. For the ministry to enter the new year in a healthy position and to be prepared to reach even more women in the year ahead, we need to not only meet this challenge; we need to exceed it as well. So, what part might the Lord want you to have in helping to meet this need? What other “Katies” might He want to use you to help reach as a result of your generosity at this time? You can visit us at ReviveOurHearts.com to make your donation, or you can call us at 1–800–569–5959. Thanks so much for the role you play in helping Revive Our Hearts call women to experience freedom, fullness, and fruitfulness in Christ! Leslie: Imagine being in a courtroom before a strict judge and you know you’re guilty. The truth is, everyone is in that situation. We are all sinners before God. But the good news is, you have someone defending you—an advocate—standing before the judge. Nancy will tell you more about it next week. Please join us for Revive Our Hearts. Revive Our Hearts with Nancy DeMoss Wolgemuth wants you to find true hope in Jesus. It’s an outreach of Life Action Ministries.